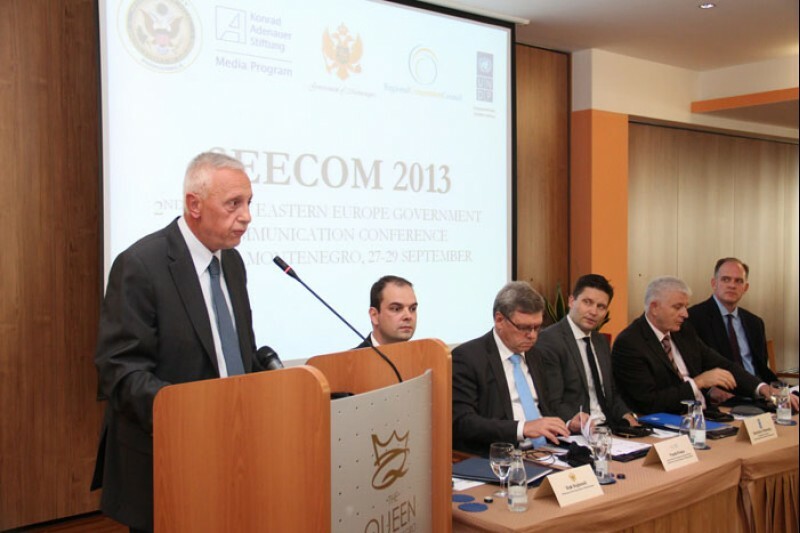 Jovan Tegovski (first left), RCC Chief of Staff, opens the 2nd South Eastern European Government Communication Conference, in Budva, Montenegro, on 27 September 2013. BUDVA/SARAJEVO – The 2nd South Eastern European Government Communication Conference concluded today in Budva, Montenegro, with the establishment of the South East Europe Public Sector Communication Association (SEECOM), as an international, non-profit, professional association of senior public sector communicators from the region. The event was organized by the Public Relations Bureau of the Government of Montenegro, in cooperation with the Konrad Adenauer Foundation (KAS), the United Nations Development Programme (UNDP) Montenegro, the Regional Cooperation Council (RCC) Secretariat, and the US Embassy in Podgorica. According to the statute, the Association will work to advance professional development and networking; stimulate partnerships with non-governmental actors, first and foremost media and civil society organizations; promote citizen engagement and good governance through transparency, accountability and free and easy access to information in public sector; advocate for higher professional standards, values and ethics of public sector communication, as well as use of innovation and new technologies. Krunoslav Vidic from Croatia was elected the Chairman and Vuk Vujnovic from Montenegro the Secretary General of the Association. Members of the Steering Board are Christian Spahr (KAS Media Program South East Europe), Dinka Zivalj (RCC) and Nadica Dujovic (UNDP). In his speech at the conference, Dusko Markovic, Deputy Prime Minister of Montenegro, stressed that the most important role of communication professionals is to be the voice of citizens within institutions, and the voice of institutions in the public, helping ensure the policies they make and implement fully reflect the needs and interests of the citizens. The conference focused on government communication in citizens’ service, optimisation of resources in public communication, usage of modern technology for improvement of two-way communication, social media, communicating EU integration, and regional cooperation. Jovan Tegovski, Chief of Staff at the RCC Secretariat, recalled that the economic crisis that hit South East Europe had made communication ever more important, making it imperative for governments to be in constant communication with their citizens to explain what is it that they are doing to help them overcome the present difficulties. The event gathered 80 top government communicators from all over South East Europe, communication experts from Europe and the US, as well as PR managers and heads of communication from the region.